So today I am sharing a recipe from my husband's grandma. 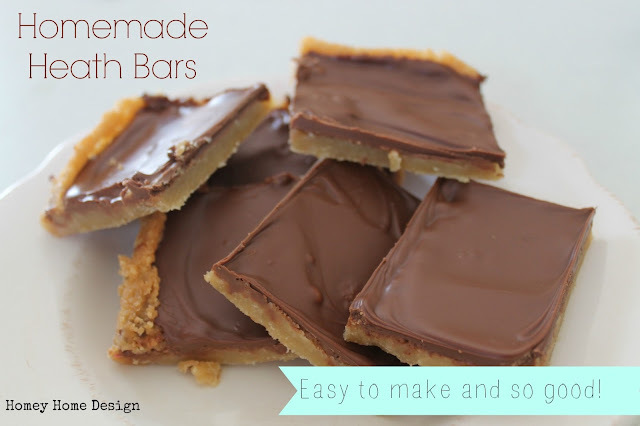 These are easy to make and take only a few ingredients. Press into a 9x13 ungreased pan and bake at 350 for 15-20 minutes. Right when it comes out of the oven, open 6 Hershey bars and lay them on top of the pan. Once they are completely melted spread them evenly across the top. And then comes the tricky part. Cutting them. I like to refrigerate them for 10 or so minutes and then do an initial cut while things are slightly firm but not hard. Cut all of your pieces. Put it in the fridge. 10-20 minutes later do it again. This will save a ton of frustration because both layers become really hard and chewy which make it super hard to cut if you don't do it as it cools. But oh, its oh so worth it!